Got some a busy week ahead of you? If you're like me, you'll be depending on your favorite to-do app to get you through it. But task lists aren't the only way to track next actions, and in some cases they may not be the best. 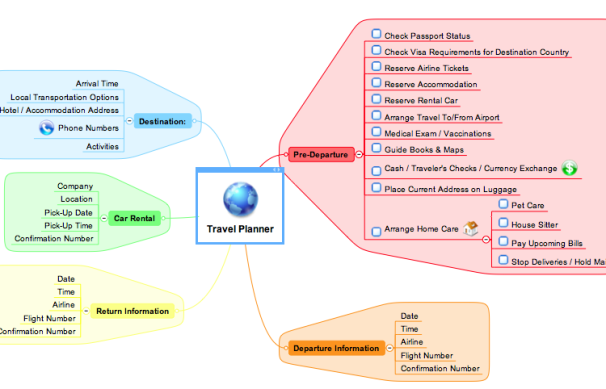 When you've got a short-term project to get through, a mind map can be a great way to track all of the tasks for a short-term project or a finite span of time--such as a trade show--on a single, visually intuitive page. The process itself should be fairly self-evident, but there are a couple of workable approaches. To track tasks by day, create a node for each day you need to track, then make subnodes for each action. The cool thing about using a mind map rather than a conventional to-do list is that mind maps are all about dependencies. Many of the most popular to-do apps, on the other hand, don't support dependencies at all. So on your mind map, every single task can have as many dependencies as it needs. That's awesome for tracking very complex projects that need to come together in a short span of time. Alternatively, you can track tasks by context, using contexts such as "convention center," "hotel," or "airport" as your primary nodes. Personally, I find this adds more confusion in trying to quickly skim the page for the nest thing to do, but I know people who passionately advocate contexts as their default mode of productivity-minded thinking. You can, of course, use any mind mapping app you have on hand, and any device you have handy. Last week, I talked about some of the best mind mapping apps for Windows and some of my favorite mind mapping tools for smartphones. I have to say, though, that Mindjet MindManager 9 has the best to-do list template I've ever seen for a mind map app. The one thing your mind mapping software is missing that pretty much all to-do apps have is the ability to check things off without completely deleting them from memory. And without that fairly basic feature, mind maps are ill-suited to completely replacing your to-do software over the long haul. Still, for tracking all the complexities of a tightly packed short-term project, this approach is well worth trying out. And if you like to print your lists and work from paper, you won't miss the digital scratch-out feature much anyway. Got another interesting use for mind maps? Tell us about it in the comments!